1970 Pontiac GTOs. Lot 90 of 95. CLICK-> Howard takes one last look at his old friend - Carousel Red 1970 GTO hardtop. I'll bet the new owner will take good care of the car. He picked out what appears to be a professional transport company. CLICK-> Orbit Orange 1970 Judge owned by Jimmy Hollywood. This was our Picture Of The Week for 4/17/05. This car sits high. I bet you can change the oil without jacking it up. We have this one in two additional sizes; 800-600 wallpaper and 1024-768 wallpaper. To make them your desktop wallpaper, click on the links, then right-click on the image, and select "Set as Background". CLICK-> Orbit Orange 1970 Judge hardtop, right front view. Body colored door mirrors were not available on the GTO in 1970, but they look great on this car. 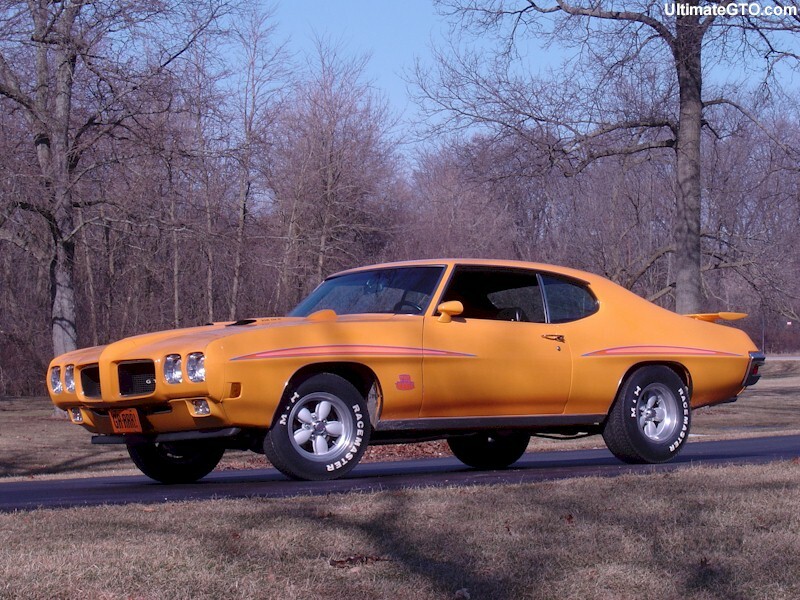 CLICK-> Palladium Silver 1970 GTO hardtop owned by Russell Esenwine from York, Pennsylvania. This was our Picture Of The Week for 6/5/05. Russel tells us, "It's fresh off a restoration. I purchased this car 10 years ago (in 1995). The car was painted orange when I bought it. I have been driving the car since, cruising and an occasional show. I finally got it into the restoration shop last year. I got the car back March 2005 in all its original 60,000 mile glory. Not bad for 35 years!" CLICK-> When Russel purchased his car, it was orange. Here it is in early hours of the restoration. 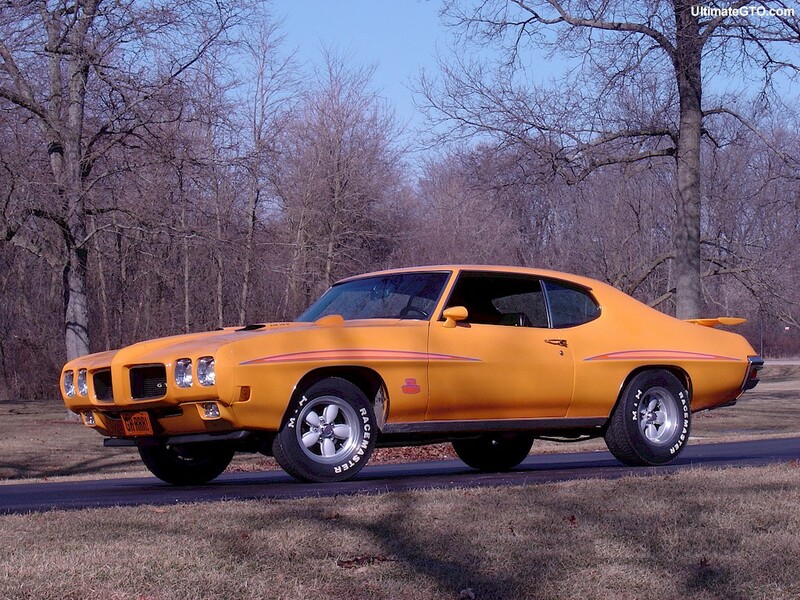 CLICK-> Palladium Silver 1970 GTO hardtop, left rear view. CLICK-> Palladium Silver 1970 GTO hardtop, right rear view. CLICK-> Flamed 1970 GTO convertible owned by Lyn & Craig Cooper from Adelaide, South Australia. Lyn tells us, "This car has been turning heads in Australia since 2000. The car was first seen on eBay and was eventually purchased over the phone, without actually seeing it. It was then shipped 1/2 way around the world." CLICK-> This is one hot car. Here's a picture of Lyn and Craig's 1970 GTO convertible at a car show in Australia. CLICK-> Both the dash and the convertible top cover are tuck-in-rolled. CLICK-> You cannot help but smile when you are riding in a flamed 1970 GTO convertible in Australia. CLICK-> Oh No! Look what happened to Bill Bolin's Carousel Red 1970 Judge. Looks like the trailer fishtailed and then hit a curb and got snagged sideways by a median. The trailer is laying across a median. Bill explains, "This is unfortunately what happened on the way to Norwalk 2005. I blew a trailer tire on my friend's enclosed trailer and was unable to control the sway. My wife and kids were with me and we were unhurt. I went home and got my open trailer and continued the trip and am glad I did. Norwalk was awesome! I hoped my car would never be seen in the wrecked section of this site but stuff happens." This car was also Picture Of The Week for 7/4/2004. Click here to see more of Bill's Car (Upright) using the Advanced Picture Searher loaded with year=1970, Model=Judge, and owner=Bill Bolin. 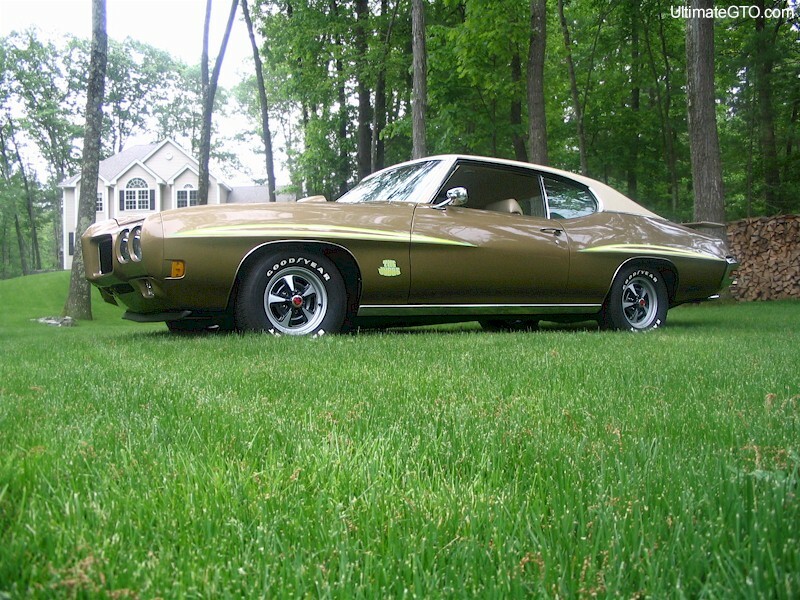 CLICK-> Granada Gold 1970 Judge owned by Paul from New Hampshire. This was our Picture Of The Week for 9/11/05. This Judge has a Sandalwood vinyl top and interior. We have this awesome shot in two additional sizes; 800-600 wallpaper and 1024-768 wallpaper. CLICK-> Granada Gold 1970 Judge hardtop, left front view. Many 1970 Judges had chin spoilers.